New Delhi, Oct 25 (IANS) The Army is looking at electronic warfare and early-warning systems not only for the front lines but also for the hinterland amid threats of more terror attacks like at the air base in Pathankot and the Army camp in Uri, Army Chief Gen Bipin Rawat said here on Wednesday. Speaking at a seminar on “Indigenous Technological Empowerment of the Indian Army”, Rawat said there was need to integrate technology with manpower. “We are also looking at electronic warfare and early-warning systems to help us not just on the frontline but hinterland as well… Security of our installations in the hinterland is becoming a concern due to reports of (possibility of) attacks on the lines of Uri and Pathankot on some of our other bases,” General Rawat said. “Therefore, we have to look at solutions to our security problems… relying entirely on manpower is not the best way forward. We will have to integrate technology with manpower to ensure that human resources are committed to the least and we are able to imbibe technology,” he added. 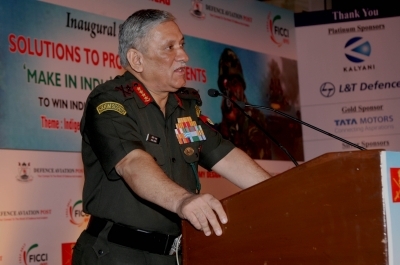 General Rawat called upon the private sector to provide solutions for perimeter security of defence installations across the country and for surveillance along the borders. “Our major requirement, as of now, is to look at intelligence, reconnaissance, and surveillance systems to keep an eye on our adversaries, both on the northern and western frontier, and then to integrate the system with other systems in the battlefield,” he said. Minister of State for Defence Subhash Bhamre said self-reliance in defence manufacture will come only with home-grown technologies. “True self-reliance in defence will flow from fully home-grown technologies,” Bhamre said. He said the central government has put defence at the core of its ‘Make in India’ programme, adding that various companies had expressed willingness to invest in India by utilising the country’s highly talented and skilled manpower.